As I went into my posts I linked some papers that I wrote on the subject matter. It was based on years of research and I thought it had some added value to the subject. "Based on my interpretation of the science, I would do Ipilimumab (Yervoy) first. Make sure you have your ALC (Absolute Lymphocyte count) tested before the trial. If it doubles by week 7, you are most likeely a responder. If not, do the HD-IL-2 regime. Here is a paper that may help you understand the science behind the treatment." I don't think this is based on "the science" but more your opinion on the science. It just hasn't been proved in enough of the population to warrant the recommendation. We must be careful in these assumptions we make. So please do not suggest that here to patients without ample evidence in large segment of the population. We had to edit out your link since it appeared to be a virus within it." I contunued to post links to clinical data that backed up the science. Catherine, if you read my intial post: I said"
Based on the science, I would do Ipilimumab (Yervoy) first. Make sure you have your ALC (Absolute Lymphocyte count) tested before the trial. If it doubles by week 7, you are most likeely a responder. If not, do the HD-IL-2 regime. Here is a paper that may help you understand the science behind the treatment." In most cases, it is not possible to completely eliminate or cure the cancer. Depending upon where and how big the metastases are, treatment may involve drug treatments, surgery, or radiation therapy. These drug treatments may be given alone or in combination. Most of these treatments must be given into a vein (intravenously) or injected under the skin, although a few can be given in pill form. Each medication is given over a period of time, sometimes up to several months, depending upon how you respond. Immunotherapy — Because immunotherapy works differently than chemotherapy, it has different side effects. Interleukin-2 (IL-2) — IL-2 is a form of immunotherapy that has been found to help some people with metastatic melanoma when given in high doses. In some people treated with high dose IL-2, the benefit can be long-lasting [1-3]. However, high dose IL-2 can cause serious and toxic side effects and it is generally reserved for people who are otherwise healthy (with good heart and lung function). IL-2 is usually given into a vein three times per day for five days twice per month. Treatment is usually completed while you are in the hospital. Potential side effects of IL-2 — Potential side effects of high dose IL-2 include low blood pressure, irregular heart rhythms, accumulation of fluid in the lungs, fever, and rarely death. Ipilimumab — Ipilimumab is a drug that stimulates the body’s immune system to react against the melanoma. This is given once every three weeks for a total of four doses. Treatment with ipilimumab may decrease the extent of your melanoma and help you live longer. But ipilimumab can also cause the body to develop an immune reaction against its own tissues. This can result in a wide range of side effects that may be severe or life threatening. The most important of these include colitis (causing diarrhea, bleeding, or more serious complications), hepatitis, rash or inflammation of the skin, and inflammation of endocrine organs (pituitary, thyroid, or adrenal). If this occurs, you might have to stop the ipilimumab and receive additional treatment for the complications. If you take this drug, it is important to tell your doctor about any side effects you experience, even mild ones. This will help avoid the more serious complications. Significant progress has been made in the treatment of metastatic melanoma over the past decade. Two drugs that stimulate the immune system, high dose interleukin-2 (IL-2) and ipilimumab, are more effective for controlling metastatic melanoma and allowing some people to live longer. However, both of these forms of immunotherapy can be associated with severe side effects. In deciding what treatment is right for you, you and your family must consider the risks and benefits of each option according to your values and preferences." "THE FIRST randomized clinical trial demonstrating an effect on patient survival for the treatment of metastatic melanoma has been recently reported using the immune-stimulating antibody ipilimumab. This is an important advance in this disease as well as a proof of concept of the ability of immunotherapy to affect the natural course of advanced melanoma. However, the objective tumor response rates are low with CTLA4-blocking antibodies. Response rates up to 50% to 70% have been achieved with an optimized combination of ex vivo, clonally expanded, tumor-infiltrating lymphocytes (TILs) administered after lymphodepleting chemotherapy and followed by high-dose IL-2 administration." "This provides further evidence of the potential of immunotherapy for the treatment of melanoma." My Therory, is that instead of clonally expanding the (TILs) tumor-infiltrating lymphocytes ex vivo, and not depleting the Tregs, WE are doing it all in vivo (Inside the Body). The reason we skip the Lymphodepleting is that the CD4-T-cell in need to secrete just the right amount of IL-2 to activate the and prime the CD-8 T-cells. 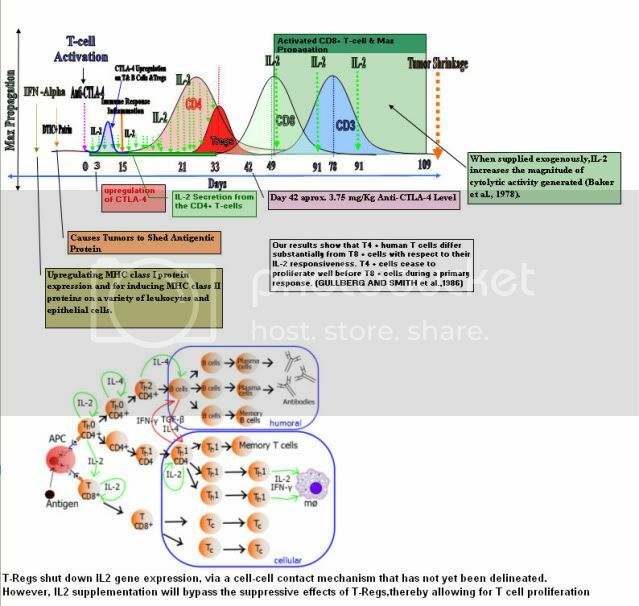 The High dose IL-2 is there to muture the CD8- T-cells into Cytotoxic T lymphocytes (CTLs). I know there are skeptics out there, but we need to read the research papers that are cutting edge to make any progress. Why is Dr. Steven Rosenberg using IL-2 in his ACT therapy? You need to think outside the box and not reject things that you don't understand. Again, Jimmy, we don't believe the science until it is proven in many individuals. Hundreds of patients should show these results before it is proven fact and enough to base an opinion about. Rosenberg has been using IL2 for 20 years or more, it is his drug of choice. Why? I'm not certain, but I've not been impressed by the results of research at NCI in melanoma. So I imagine there is funding from the industry for this particular drug to be used. And they need funding desperately for melanoma at NCI, it is not a priority. I would just suggest that our recommendations be based on large studies here and so far Yervoy has more promise than IL2 and is far less debilitating..
Thirty-six patients with stage IV metastatic melanoma were treated with ipilimumab at doses in the range of 0.1–3mg/kg every 3 weeks combined with IL-2 at 720,000 IU/kg every 8 hours to a maximum of 15 doses . There was an ORR of 22%, with three patients having a CR and five patients having a PR. Five of the responses occurred among the 24 patients treated with ipilimumab at 3 mg/kg, and one each occurred in those treated with 0.3, 1, and 2 mg/kg. Six of the eight responders had ongoing responses at follow-up of 11–19 months. The 22% ORR reflects an additive rather than a synergistic effect for these two agents, although durable responses were demonstrated. Based on the initial experience with ipilimumab in combination with chemotherapy or IL-2, additive effects have been seen, as opposed to synergy. However, the results from these trials suggest that combination therapy with ipilimumab may play an important role in the treatment of metastatic melanoma; larger trials are required, including an ongoing phase III trial of ipilimumab plus dacarbazine compared with dacarbazine alone in frontline therapy, before further conclusions can be drawn. Background: We have previously shown objective clinical responses in patients with metastatic melanoma treated with CTLA-4 blockade using ipilimumab. We have treated 179 patients in 3 separate clinical trials and now have long-term follow-up to evaluate the durability and unique features of this immunotherapy. Methods: A total of 179 patients with metastatic melanoma were treated in 3 trials: In Protocol 1, 56 patients received ipilimumab with gp100 peptide vaccines. In Protocol 2, 36 patients received ipilimumab with high-dose interleukin-2 (IL-2). In Protocol 3, 87 patients received intra-patient dose escalation of ipilimumab and were randomized to receive gp100 peptides. We have updated and analyzed the follow-up and survival data for these trials. Results: With median follow-up for Protocol 1, 2, and 3 being 80, 71, and 60 months, median survival was 15, 16, and 13 months, respectively. Objective tumor regression was 12% for Protocol 1, 25% for Protocol 2, and 21% for Protocol 3. Patients in Protocol 2 had a 17% complete response rate (6 patients: 77+, 74+, 72+, 71+, 71+, and 69+ months), as compared to 7% in Protocol 1 (4 patients: 82+, 81+, 79+, and 66+ months) and 8% in Protocol 3 (5 patients: 64+, 63+, 62+, 60+, and 55+ months); all complete responses are ongoing. Many patients who eventually became complete responders had continual tumor shrinkage after stopping therapy. Conclusions: CTLA-4 blockade with ipilimumab can achieve durable objective tumor regression in patients with metastatic melanoma. The combination of ipilimumab and IL-2 appears to have an increased complete response rate, although this needs to be tested in a prospective randomized trial. This report represents the largest single-institution experience with the longest follow-up for this agent; our results support its role as a viable treatment option for patients with metastatic melanoma. Catherine My Theory does have Merit. It is the Science backup with some clinical Data. Lets Think OUTSIDE THE BOX!!!! This just isn't the place for you to post all of this. Just give the citations. As I mentioned in the other response to your post, you are not a peer reviewed credentialled medical researcher. We always think outside the box here but we also keep in mind the validity of research and whether large numbers of people benefitted. We also talk in terms that people can understand easily. You are a missionary by your self description, bent on a mission and we are navigators exploring all options. The MIF Website and Forums are designed for educational purposes only and are not engaged in rendering medical advice or professional services. The information provided through this Website should not be used for diagnosing or treating a health problem or a disease. It is not a substitute for professional care. If you have or suspect you may have a health problem, you should consult your health care provider. This just isn't the place for you to post all of this. Just give the citations. As I mentioned in the other response to your post, you are not a peer reviewed medical researcher. Catherine, What credentials do you have may I ask. How many patents do you have. I rest my case. You are blinded by your own lack of understanding. This just isn't the place for you to post all of this and we don't like our forum to have the negativity that you exhibit. Just give the citations as you are taking space away from others. As I mentioned in the other response to your post, you are not a peer reviewed credentialed medical researcher. I have never claimed to be either. I rely on the opinion of medical experts who are credentialed and peer reviewed in their work in melanoma research from the outstanding cancer centers who specialize in melanoma. We always think outside the box here but we also keep in mind the validity of research and whether large numbers of people benefitted. I know you are promoting what worked for you and then backing it with research you have found that could be interpreted in a different light. We also talk in terms that people can understand easily. You are a missionary by your self description, bent on specific therapy mission and we are navigators exploring all options. You have your own website for that purpose and we'd appreciate you keeping your lengthy opinions there. Thanks, as you can see, Catherine Poole is pushing her own agenda and has delete my entries. What happen to the Freedom of Speech act? This forum is NOT moderated by specialists in melanoma, primarily by volunteer dermatologists and oncologists on a weekly basis. This is very Sad. If you go to Melanoma International Foundation for advice, You may not be getting the whole picture. who is sending out The Negativity. "We don't like our forum to have the negativity that you exhibit." I don't delete links and entries or comments on my web blog. Everyone is entitled to their opinoin. Bristol-Myers Squibb today announced that the European Commission has approved YERVOY™ (ipilimumab) for the treatment of adult patients with previously-treated advanced melanoma. After Activation With Yervoy, IL-2 Produced by Activated CD4+ T Cells Helps CD8+ T-Cell Activation. IL-2 Is Critical to CD8+ T Cell Activation at Early Time Points during Priming. It is hypothesized that IL-2 may help CD8+ T cell activation through enhancing the signal that drives proliferation. Generation of Potent CD8+ T Cell Anti-Tumor Effector Function Depends upon IL-2 Help. IL-2 signal at priming drove better anti-tumor CTL function in vivo. Yervoy (Ipilimumab) + IL-2 = Melanoma CURE!!!! You must get the tumors's microenviroment in the right configuration for it to work.